David Davis has successfully fought off a fierce Liberal Democrat challenge in the 2005 election to be re-elected as the MP for Haltemprice and Howden. The shadow home secretary increased his majority over his nearest rival Jon Neal to 5,116. Labour successfully defended all three Hull seats as well as holding Brigg and Goole, Scunthorpe, Great Grimsby and Cleethorpes south of the Humber. The Conservatives also held Yorkshire East and Beverley and Holderness. 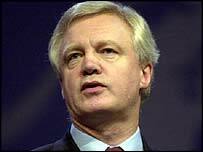 David Davis thanked the people of Haltemprice and Howden in his victory speech. He said: "It has been a singular privilege to represent and serve them these last few years and it is an honour to continue to do that. "I will do everything in my power to make sure their government does what they want - not serve its own interests." John Prescott continues in the role he has held since 1970 after winning Hull East with a 11,747 majority. The deputy prime minister paid tribute to the "hard working members of the Labour Party" after his victory. Earlier on 6 May, Work and Pensions Secretary Alan Johnson retained Hull West with 15,305 votes and a majority of 9,450. "This job is really a wonderful job, to represent people and have people vote to have you as their representative," said Mr Johnson. "I don't know why they do it. I just want to work hard for the people who elected me." Diana Johnson became Hull's first female MP when she took the seat vacated by Kevin McNamara. Her majority of 7,351 was significantly lower than in 2001, representing a swing a 6.3% swing from Labour to the Liberal Democrats. She described her victory as an endorsement of the work the party had done in the city in the past eight years, but admitted there was more to be done. "In Hull in particular education needs some extra work and that is where I am going to be focusing my work over the next few years," she said. "I want to say how proud I am to be joining Labour in government at this historic time." There was a closer contest in North East Lincolnshire where Shona McIsaac narrowly beat Conservative candidate Martin Vickers in Cleethorpes with a 2,642 majority. Great Grimsby's long-serving MP Austin Mitchell and Scunthorpe's Elliot Morley successfully defended their seats - albeit with reduced majorities. Mr Morley was philosophical about the margin of his win, saying: "I was originally elected with a majority of 500 so really winning is what is important to me and I won't get too hung up on the result." Newly elected Conservative MP Graham Stuart said he planned to make himself very accessible to the people of Beverley and Holderness who elected him with a 2,580 majority. He said: "I plan to be upfront and have a high profile, not only within the constituency but nationally," he revealed. In Yorkshire East, Greg Knight held the seat for the Conservatives with a 6,283 majority.